New restaurant offers a taste of the Comox Valley and Vancouver Island. 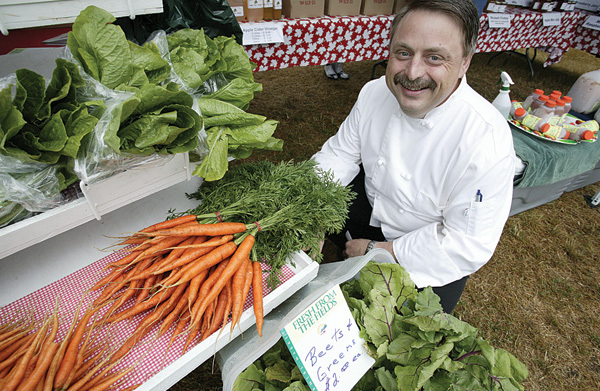 Chef Ronald St. Pierre shows off some Comox Valley farm fresh ingredients going into the dishes served at Locals. The original inhabitants of the Comox Valley recognized the incredible bounty of the land and so named their slice of Island paradise “Komoux, discount ” roughly meaning “Land of Plenty.” With schools of salmon teeming in the ocean, see mushrooms and berries exploding from the forests, great soil and a climate ideal for agriculture, the people of the K’ómoks First Nation were able to thrive off of their land’s natural abundance. Today, in a time where the food on our plates is more likely to come from across the ocean than from the farm down the road, one local chef is making it his mission to re-introduce the concept of local cuisine in a globalized community. 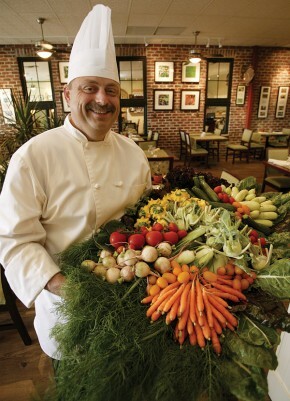 Ronald St. Pierre is the owner of Locals – Food from the Heart of the Island. The Comox Valley’s newest restaurant, Locals is also the only one dedicated exclusively to showcasing the local producers that our land still supports. Originally from St. Pie-de-Bagote, a small farming community in rural Quebec, St. Pierre was amazed at the quality of the Comox Valley’s locally produced foods when he arrived here 17 years ago. Locals’ menu features a wide selection of that bounty, such as Valley-raised meats, fresh seafood and local mushrooms, vegetables and cheeses. Even the wine list, comprised exclusively of BC wines, includes several selections from the Comox Valley and elsewhere on Vancouver Island. St. Pierre has no shortage of local goodies from which to choose. The Comox Valley is home to nearly 500 working farms on both land and sea that inject almost $41 million into the local economy, and the local agriculture sector is only getting stronger. In fact, the amount of agricultural land in the Valley increased 32 per cent last year, according to the Comox Valley Economic Development Society (CVEDS), in a year when most parts of BC saw their agricultural land decrease or remain the same. Country Guide, Canada’s leading agriculture magazine, has even recognized the Comox Valley as one of eight “hot spots in agriculture”. While the recognition honours the Valley’s wide range of agricultural products, it also recognizes a special attitude toward local food within the community, says CVEDS executive director John Watson. Ronald St. Pierre hits the Saturday morning Farmers’ Market looking for ingredients. For St. Pierre, that next level goes beyond simply serving quality local food, and it has a lot to do with the long-term sustainability of the community. His approach embraces everything from supporting local farmers to recycling whenever possible, and he proudly states that Locals donates all of its food waste to a neighbour who uses it to feed her pig. He cites a recent statistic that claims that only three per cent of the food consumed on Vancouver Island is actually produced on the Island. “When you think about that, it’s pretty bad,” he says. “If we have an earthquake, or something goes wrong and all communication was to stop, there are a lot of people who would be going hungry.